We were excited and honored to once again partner with DIY Network® on Blog Cabin™ 2015. Blog Cabin is an interactive experience that lets viewers not only vote on options to help design the home, but it also gives viewers a chance to enter to win the house at the end of construction! Helping to transform the original 1970s home are some familiar faces from some of your favorite DIY Network shows. This year’s Blog Cabin is a beautiful modern mountain retreat with picturesque lake views near Lake Coeur, Idaho. Viewers had a chance to vote on a new pet drinking fountain color for this scenic getaway. The choices were between Lake Breeze and Cocoon, and fans chose Lake Breeze. The new color really adds to the bright, lake-front living feel of the house. We think it was the perfect choice! 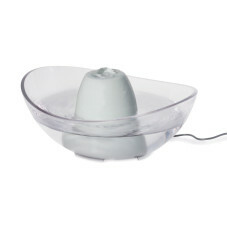 You can find the new Sedona fountain and other PetSafe® brand products in the game room of the sprawling abode. This pet-friendly corner is the perfect place to relax with friends and furry family. 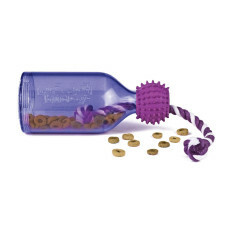 In the pet corner, indigo Smokehouse Strips® treats, the Busy Buddy® Tug-A-Jug™, and the Busy Buddy® Squeak ‘n Treat Troog toys keep your pet engaged and playing while you are too! To tour the rest of the Blog Cabin™ home and learn how you could win the sweepstakes and live in this amazing home, visit www.diynetwork.com/blog-cabin. We hope you're inspired by the Blog Cabin. Does your pet have a special room or area in your home? Tell us about it! Courtney works for Accounts Payable and the PetSafe® Brand Marketing team. Her baby in fur clothes, Jess, happily accompanies her mom to the office.